No matter how fine the exterior garment, something easily washable must be worn close to the skin. It is likely that some form of linen underwear went under the joined hosen; although Newton does not reference this item in her text, Jacqueline Herald used the Italian term mutande, so I have adopted that here. The mutande were a great deal of fun to construct, as they are one of the first clothing items I have ever attempted to make without seeing another person's pattern or finished garment. I began this intimate garment primarily because I found an excellent visual source and wanted to reconstruct the pattern. It seemed appropriate that I should not only recreate the dress of a Venetian nobleman from head to toe, but also from the skin out, and that meant period undergarments, too. The mutande I am copying (below) are painted onto Saint Sebastian by an artist working in the 1470s in Messina, Sicily, so I am not arguing that they are Venetian or from 1500. They are from within a few decades of my target date, and from the same general area of the world, and I think they are quite likely as an undergarment under hosen. They are short and snug enough that one can wear hosen over them without clear lines. Additional searches for Saint Sebastian and Saint Roch will show you some more artists' versions of mutande, including the image to the right, which was painted by a Venice-born artist, and seems to be similar to the clothing below. 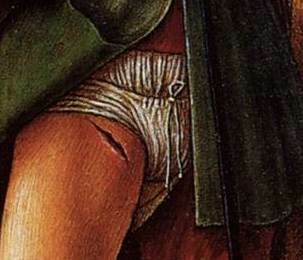 I am using this painting of Saint Sebastian because, with the detail visible in the image below, I can see clearly a flat felled seam holding a gusset into the middle of the garment, and I can see a narrow drawstring closure; with these observations I was able to imagine the form of the garment. I started with a center gusset shaped like a teardrop with points at both ends, and two rectangles. I had the gusset start at the top of the front, but several inches down from the top in back. To reach my final pattern I had to figure out how much "leg seam" to put into each side (answer: an inch or less, and each should come out from the gusset at almost a 90 degree angle) and how much curve to put into the bottom of the leg around the hips (more than I originally expected). The garment also curves down in front to rest comfortably under the belly, and rises almost an equal amount in back so as to cover the curve of the buttocks. After sewing two muslin mock-ups I cut my final linen. I found that I had to make several small adjustments and re-sew multiple seams even then, as I had made the leg region too loose and let the pattern pieces come to too sharp a point at top in center front and center back. It is because of these mid-final-product pattern alterations that the drawstring opening (which I reinforced as if it were a tiny buttonhole) is inside the waist, instead of outside. I also dislike the little "hump" in the middle of the back; the next pair I cut will have a more gentle curve. My husband has worn these for multiple days and claims that they are comfortable and that he has almost as much range of movement as he has in modern knit and elasticised underwear. This is important to him, as he fights rapier. One wonderful discovery to note: after finishing these, I was adjusting the fitting for his new wool calce. When we tried them on over the mutande, it was much easier to fit the hosen than when we tried fitting the same item over modern boxer briefs. The wool fabric moved smoothly over the linen undergarment, whereas it clung and twisted on the modern knit one. Also, the mutande were cut higher and fit more snuggly, making it easier to tighten up the fitting of the hosen. I displayed the mutande at the Known World Arts and Sciences display in the barn at Pennsic XL (August 2011). After someone anonymously tucked a dollar bill into the waistband, they got quite a lot of smiles. A photo of this display even ended up in the Pennsic Independent. I sewed the seams with waxed linen threads unraveled from a scrap of the linen used to make the garment. The linen pieces are joined with a running stitch, with back stitches every inch or so for strength. The legs are finished by being twice folded and then topstitched with a running stitch. 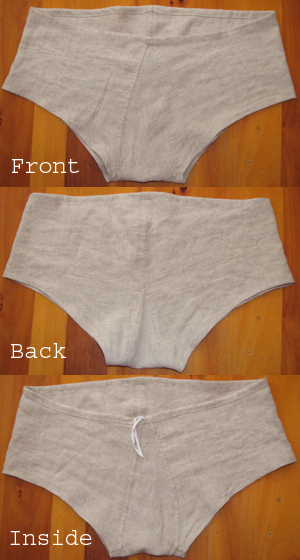 The waistband casing for the drawstring is just a deeper fold like that on the leg. 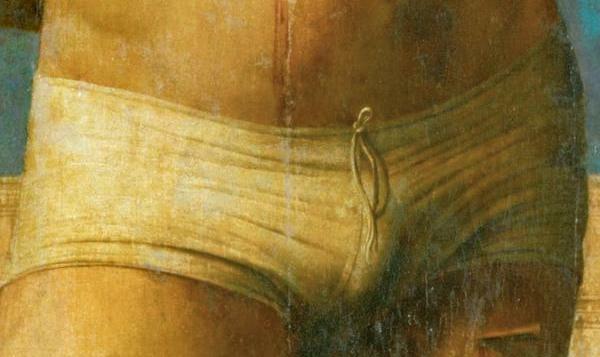 The edges of the center gusset are secured with a flat-felled seam, because this creates not only a smooth, flat inside, which seems appropriately comfortable for a skin-tight garment, but I also believe that this is the type of seam I see on the painting of Saint Sebastian. The opening for the drawstring is just a tiny section of the center front seam left open, with the top and bottom of the opening reinforced with several long stitches and the sides of the opening held in place by overcasting the edges. The drawstring is quarter-inch cotton twill tape, ends left unfinished so that they will unravel slightly, as the Saint's have done.